A standard fare for this HD TV? Toshiba's 32WLT66 comes with two HDMI ports. A rare find on TVs twice its price. Given the price Toshiba is offering this LCD integrated digital television (IDTV) for, you'd be forgiven for thinking that the company has cut back on what it's put inside a rather smart chassis. Gladly, that's not the case. Alongside the standard line-up of sockets, and a common interface slot for accessing terrestrial pay-TV services (currently limited to Top Up TV), this set has two HDMIs - an unusual find in flatscreens costing twice as much as this one - and the surprises continue inside. The set uses Toshiba's Active Vision LCD processing - a suite of systems that boost brightness, detail, colour and contrast in standard and high-definition pictures. There are options to tweak basic colour components, and to optimise the set for use as a PC monitor. There's also a Cinema mode to improve the quality of material from progressive scan sources, such as high-end DVD players or the Xbox 360 games console. There is one, unusual, optional extra. While other flatpanels are content with providing a line out for subwoofers, for an extra £350 this TV can be fitted with its own. This set improves on Toshiba's already impressive LCD pedigree. Black levels are deeper than on most other LCDs, and they're able to retain a high level of detail. 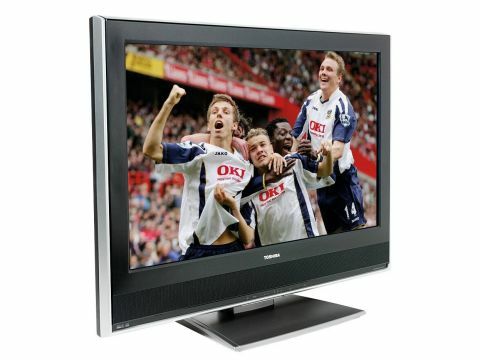 This impressive performance is carried over from HDTV broadcasts to Freeview digital channels, and even analogue TV. Like many flatpanels, the audio is less impressive than the picture quality. Deep and high tones seem to go missing using the set's basic speakers, but dialogue remains clear. This set is a remarkable achievement. Excellent connections and a stunning performance make it a choice LCD TV.